I love this salad. It’s prefect to make the night before and take to work, or for summer BBQ’s, entertaining friends, you name it. So yum! Cook quinoa. Add quinoa, water and 1/4 teaspoon salt to a pan. Bring to a boil. Once boiling, cover and reduce to simmer until all liquid is absorbed, about 12 minutes. 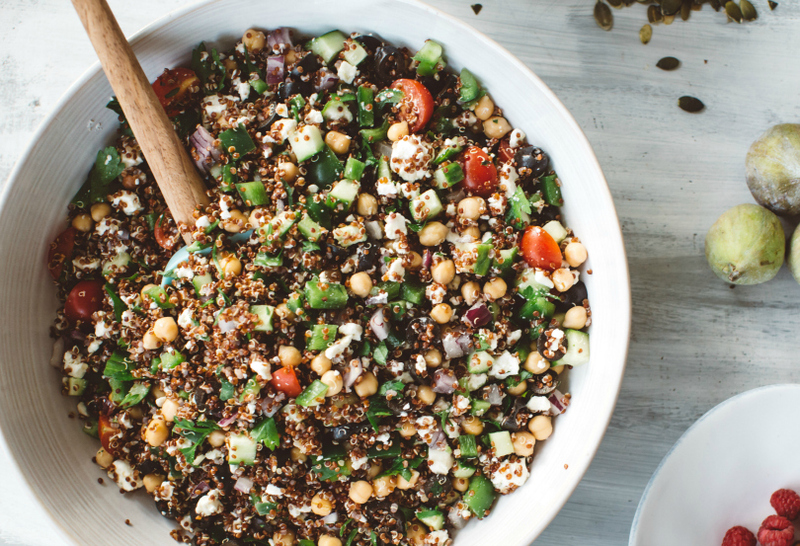 Spread your cooked quinoa on a baking tray to cool faster. If you add your veggies to hot quinoa they will go soft and mushy. Wait for quinoa to cool or make it in advance. In a large bowl combine remaining ingredients and stir together. Add cooled quinoa to bowl of veggies, mix well to combine. Add dressing and stir. You can make this day or night before and it's even better when the flavours have had time to marinate.